We’ve already published two articles about DC Comics’ decision to cancel the Renae De Liz written-and-pencilled and Ray Dillon inked-and-coloured comic series The Legend Of Wonder Woman, half-way through the production of its second volume, without publishing an issue. So, yes, here’s a third. And I can confirm that the decision to cancel the book was due to politics and not to sales. 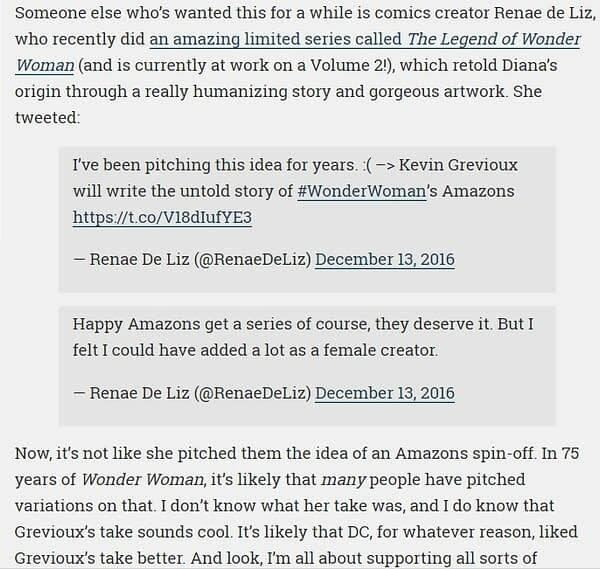 A few days ago, DC Comics arranged promotions for The Odyssey of the Amazons, a new comic by Underworld creator Kevin Grevioux and Ryan Benjamin, telling the origin stories of the Amazons, a story he pitched to DC, who would later give birth to Wonder Woman. In a series of tweets from Renae De Liz and Ray Dillon, they complained that such a series was being written by a man, when Renae had pitched a similar series. 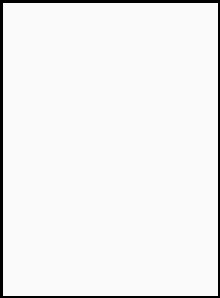 The Mary Sue ran an article that now-deleted quoted tweets from De Liz, though I understand Dillon’s were harsher. And I understand that people at DC Comics believe that the Mary Sue article itself was arranged by Dillon. And then embedded the now-deleted tweets. Happy Amazons get a series of course, they deserve it. But I felt I could have added a lot as a female creator. 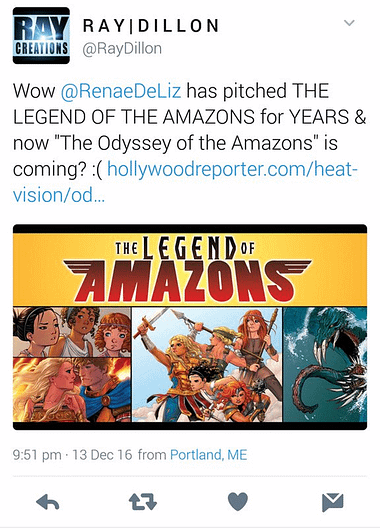 Now, it’s not like she pitched them the idea of an Amazons spin-off. In 75 years of Wonder Woman, it’s likely that many people have pitched variations on that. I don’t know what her take was, and I do know that Grevioux’s take sounds cool. It’s likely that DC, for whatever reason, liked Grevioux’s take better. This was all removed and the rest of the article remains as published. 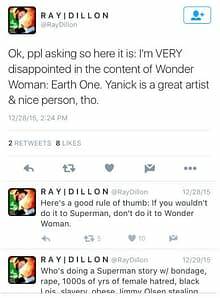 I understand from well-connected senior sources that this article, combined with some harsher tweets aimed at DC by Ray Dillon, is being held responsible inside DC Comics for their decision to cancel the Legend Of Wonder Woman. As we pointed out, this is not the first time this kind of thing has happened at the publisher with other creators. Indeed, two of them were directly my fault as well. I have been in the exact same position that Mary Sue now finds itself. Public criticism by a staff member or freelancer, especially if it reaches the press, is the ultimate no-no. This is the one tweet of Dillon’s we have been able to recover. But there were some similar older ones, regarding another Wonder Woman comic, the Morrison/Paquette graphic novel Wonder Woman: Earth One from DC that might be seen as following a pattern – thanks to mikaellives in the comments. I have also been repeatedly informed that DC editorial and PR’s problems are far more to do with Dillon than with De Liz. But it was the Mary Sue article that really did for the book. Neither Dillon, De Liz or Jusino replied to Bleeding Cool enquiries made earlier. But after publication, Mary Sue editor Dan Van Winkle told Bleeding Cool that “Our article wasn’t “arranged” by anyone. Thanks for asking us, though!” Of course, we aren’t the ones he has to convince, they’re all in Burbank and seem to have made up their minds. Batman 66 Meets Archie? Betty And Veronica And Harley? ?